Produce: Trader Joe’s takes all the annoyance out of eating your veggies and serves up couch-potato proof packages of pre-washed, pre-chopped and sometimes even pre-seasoned fruits and vegetables. I managed to avoid brussel sprouts for thirty years but TJ’s makes them so adorably inviting I’ve made them a staple. But if you’re one of “those people” who prefer your produce DIY-style, they have that too. Tower of Bananas: This little gem deserves to be one of the Seven Wonders of the World. TJ’s bananas are the svelte-blemish-free-class-president-head-cheerleader-always-sit-at-the-cool-kids’-table bananas. In no other store in all the land can you expect to always find hundreds of perfect bananas clamoring to be taken home to your banana hook. Cookies & Candy: Clear containers letting you peek directly at your future stash of chocolate-covered almonds with sea salt or organic mini chocolate chip coconut cookies give every treat a homemade vibe which automatically negates any potential calorie or carb concerns. And if that alone doesn’t do it, the labels usually have enough other adjectives like “natural” or “gluten free” to make it a health investment akin to eating a stalk of asparagus. Wine: In a blind taste test involving some very snooty wino friends of mine, the majority voted two-buck Chuck to be the best-tasting wine of the bunch. Granted, we’d been drinking. Check-Out: Whip out your reusable tote and you’ll feel like you’ve won some ten-thousandth customer sweepstakes every time. First, there’s a celebratory ringing of the cashier’s bell and then you get to put your “raffle ticket” in a drawing for a TJ’s gift card. It’s all wonderfully exciting. The best part about Trader Joe’s is you just feel like a good person for shopping there. You swagger outside the land-of-many-adjectives with your canvas bags full of free-range cage-free grade A brown eggs and grass-fed locally-grown organic lean turkey breast so fired up on your healthy finds it powers the rest of your day. And after your salad dinner and a long walk with the dog you settle on the couch with your Charles Shaw cabernet and a block of Peruvian dark chocolate and watch Bachelor Pad – ‘cause by golly you’ve earned it. This entry was posted in Cooking, Family, Fitness, Food, Friends, Health, Home, Humor, Life and tagged Charles Shaw, grocery, shopping, TJ's, trader joes, two-buck Chuck. Bookmark the permalink. Would love to see the tower of bananas! I need to remember to snap a pic it’s absolutely worthy! I’ve heard good things about Trader Joes and it’s obvious he knows the market place and how to use it. Howerver I refuse to eat anything that’s supposed to be good for me. I’m advised that that little slice of irreverance is going to kill me. Probably, but since I’m 73…hell just pass the bottle. Ah the dark aisle… it’s my most unguilty guilty pleasure. So a little secret I’ve learned is their gluten free chocolate chip oatmeal cookies are approximately 4752 calories a pop…if unhealthy and yummy is your thing then I highly recommend. This must be Valhala sho’ nuff. Two days calories in one cookie and gluten free? Ok, that settles it. I’m there. what’s a gluten? That caused a few real laugh out loud moments. And its true…I do tend to shop there in my yoga clothes. I adore Trader Joe’s, our new apartment is just down the bike path from one and I’ve taken to grabbing my reusable tote and walking down for produce every few days. I have become addicted to their flavored pepper grinders: I have lemon, rainbow, flower and smoke. They always have something new and tasty to try, and I like the smallness of it. It’s not a grocery emporium. These grinders are new to me! Thanks for the tip..think I’ll have to try this “rainbow” you speak of. I just involuntarily uttered one of those “heavens no!” gasps reserved for old black and white dramadies. I can’t wait for the anti-TJs post. And thank you for the compliment to soften the blow. My sister LOVES T.J. I however don’t do any “regular” shopping there, I only wander in when I need a bucket of chocolate peanuts. I don’t know why. “Bucket of chocolate peanuts” just officially made my shopping list. Austin, TX is getting one soon, and this just made me more excited! It’s just one of those things you never knew you were missing. Like when TiVo first came out. I’m excited for you too! Great Post! The nuts at my TJ’s is the best price in town along with the best price on bananas. Love exploring the candies and cookies too – ha! Happy Sunday! The nineteen cent banana is a killer deal! Oh I drank that Koolaid years ago. TJs is the promised land. I hear the promised land has terrible parking lots too. I love TJ’s but whenever it’s claustrophobically crowded I have this fantasy of announcing over a megaphone, “Coachella has been canceled!” just to get the place to myself…. I love me some Trader Joe’s, but I do make a point to use their produce right away. At least here in the Southern California stores, it doesn’t last too long. 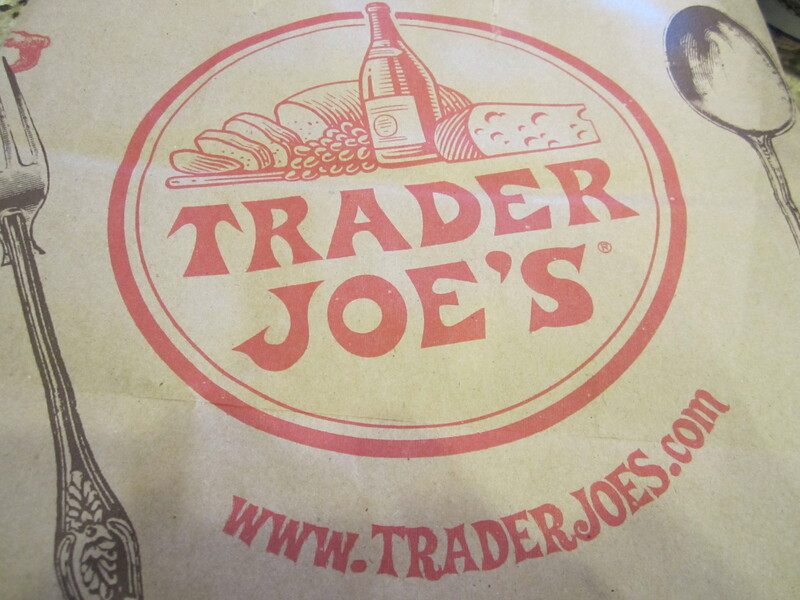 I recently went to Trader Joe’s for the first time myself, too… I loved it! I felt like I was a spy being in there, or something but luckily everyone in there seemed to think I belonged, so I just went with it. I got a box of Snickerdoodles there, and they was so damn good. I, too, live in southern California, but waaaay out in the desert where the nearest TJ’s is 100 miles away. We visit nearly every time we’re back in civilization. Their (frozen) ahi tuna steaks are truly divine (as is their pineapple salsa and their blueberry scones). I do miss having them close by. Yes yes and YES! I’ve tried all three of those and adore them. The blueberry scones are completely a treat.